What is the most efficient way to answer the most important questions to improve care for cancer patients? Drs. 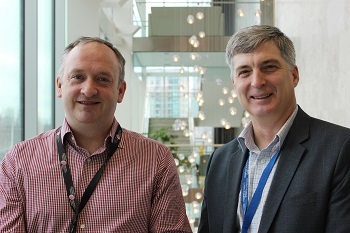 John Hilton, Mark Clemons and Dean Fergusson got a group of Ottawa researchers together to answer this question and came up eight key principles, which form the basis for their Rethinking Clinical Trials (REaCT) Program. As described in the Journal of Oncology Practice, REaCT involves comparing different approved treatment strategies rather than developing new ones. It also involves a streamlined process for obtaining oral (rather than written) patient consent, immediate randomization into treatment groups using a mobile device and simplified data collection. Their first trial, which compares two strategies to prevent chemotherapy-related infections in breast cancer patients, has recruited nearly 150 patients in just over 18 months, at a small fraction of the cost of most cancer clinical trials. Nine other REaCT cancer trials are currently underway (with support from the Ottawa Methods Centre) and the hope is to expand to other areas as well. Authors: John Hilton, Sasha Mazzarello, Dean Fergusson, Anil A. Joy, Andrew Robinson, Angel Arnaout, Brian Hutton, Lisa Vandermeer, Mark Clemons. Update: This research was featured in the Ottawa Citizen story New approach to clinical trials could revolutionize cancer care.